Drum Corps International is proud to announce the renaming of its popular DCI Today magazine to Drum Corps International Magazine. Produced in the fall, winter and summer; Drum Corps International Magazine will continue to be published by In Tune Partners, the publisher of In Tune Monthly, a popular magazine with wide circulation in music classrooms across the country, also known as "the musician's textbook." "Drum Corps International has made great strides in the last year to improve the depth, quality and variety of content offered in our magazine. As we move from DCI Today to Drum Corps International Magazine, we look forward to continuing to add new features, columns and information which will help to provide a blueprint for the success of drum corps members and marching band students, while also entertaining and informing new and old fans alike," said DCI Executive Director Dan Acheson. 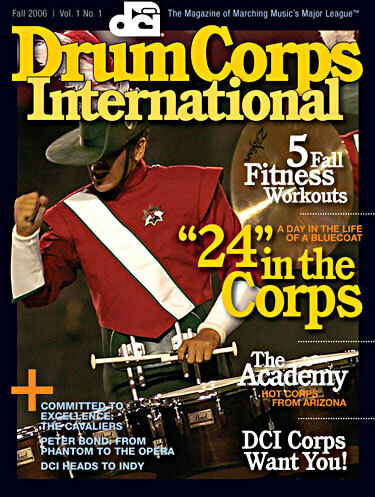 The fall issue of Drum Corps International Magazine is scheduled to be distributed at the beginning of October. Fall features include: a day-in-the-life of a Bluecoats color guard member on the summer tour, corps audition info, fall fitness and off-season conditioning tips, rehearsal and performance technique lessons written by staff members of the top DCI corps, and more. Subscribe now to make sure that you don't miss a single issue!